This article has been published previously by Way Beyond Borders and the Woodinville Weekly and republished with permission. I was a woman on a mission when I set out on my Peruvian Amazon riverboat adventure with International Expeditions. Like most of my fellow passengers, visiting the Amazon was a bucket-list destination, one that promised to be a significant and momentous travel experience. My objective was to learn firsthand about this unique environment and its diverse wildlife, as well as about the people who inhabit its lush and verdant rainforests. I had another goal, though, which was to see an anaconda snake. Odd, I admit, but for some reason, this creature has always held a curious allure for me, after having heard tales of its almost mythical proportions and surreptitious existence. In the wild, an anaconda spends most of its time hanging out in rivers hunting for food. A solitary snake, it is somewhat shy and not easily seen, due to being camouflaged in the swamps and bogs in which it thrives. The Amazon is the Anaconda’s home and I knew this trip represented the best opportunity for me to finally come eye-to-eye with this storied reptile. The Amazon is by far the largest river system in the world, containing over two-thirds of all the unfrozen fresh water on earth. There are over 1,100 tributaries within this system, seventeen of which are over 1,000 miles long. The mouth may be 300 miles wide and up to 500 billion cubic feet of water surge out to sea per day. In 24 hours, the flow into the Atlantic would sustain New York City’s fresh water needs for nine years. Such mind boggling facts can be difficult to process and are usually met with jaw-dropping amazement from visitors to this legendary destination. The extensive waterways and favorable climatic conditions of the Amazon Basin have fostered the greatest development of rainforest to be found anywhere on this planet. Over twenty percent of Earth’s oxygen is produced in this area. Though the exact number of plant species existing in Amazonia is unknown, over 25,000 have been identified thus far, with new species constantly being discovered. As for wildlife, the place is a veritable bird-lover’s utopia. Its rich canopy of tropical vegetation is home to an astounding percentage of the world’s bird species. Each day, when we left our mother ship, La Estrella Amazonica, and went on various naturalist-guided excursions via skiffs, we were treated to the sight of countless numbers of birds of every color and size. Their musical sounds created a melodic symphony in the forest. And they possessed delightfully descriptive-sounding names such as wattled jacana, laughing falcon, glittering-throated emerald, spangled cotinga, Amazonian umbrellabird, masked crimson tanager and cobalt-winged parakeet, among many others. One of my favorites, the horned screamer, a large bird with a small chicken-like bill and spiny structure projecting forward from its crown, is known for its quirky attributes. It flies like a vulture, walks like a duck and actually sounds like a donkey; a noise that continued to elicit laughter among our group no matter how many times we heard it. Our naturalist guides, Segundo and Usiel, as well as our expedition leader, Dennis, never ceased to impress me with their eagle eyes and encyclopedic knowledge of the Amazon. While on the skiffs, our heads and bodies were in constant motion. We jockeyed in position, whipping our binoculars around in every direction each time a different bird was spotted. It was a dizzying and dazzling experience that left us in awe of the array of avian life present. And although I am not a birder, I took great satisfaction in being able to recognize a few species after a while, even having enough confidence, for example, to excitedly call out, “Yellow-headed caracara at three o’clock.” The reward was a nod from the naturalist confirming the identity. The Amazon is also a dream come true for butterfly enthusiasts, with more than 4,000 species of these delicate creatures and some 20,000 species of moths. They are an incredible sight, as they flutter by the water’s edge or along a jungle trail adorned in their brilliant apparel. They join the parade of flamboyant insects such as the rainbow grasshopper and the pink-toed tarantula, along with all the glittering frogs, toads, lizards and turtles that we found along the river. 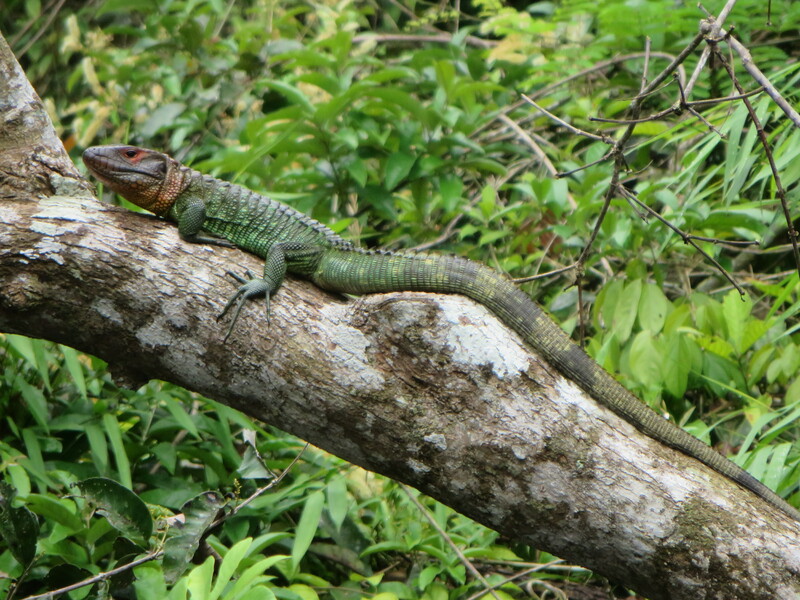 So much of the wildlife, from the green tree iguana and three-toed sloth to the long-nosed bat and olive whip snake, artfully conceal themselves to prevent predators from finding them. They seamlessly blend into the environment, appearing as parts of leaves, sticks and branches. It took me some time to train my eyes and even then, I would have missed dozens of creatures had not the guides pointed them out. I realized quickly on that the Amazon teems and pulsates with life, even when you can’t see anything moving. It’s a living, breathing system; a complex organism that never sleeps. Though there are some large animals in the Amazon, many are nocturnal and remain inactive during the day or choose to remain hidden. Monkeys, however, are the exception. They are out in full force, jumping and almost free-falling from tree to tree high up in the forest canopy. Their noises identify them long before they’re visible. We reveled in their sight and took great joy in observing their behavior. 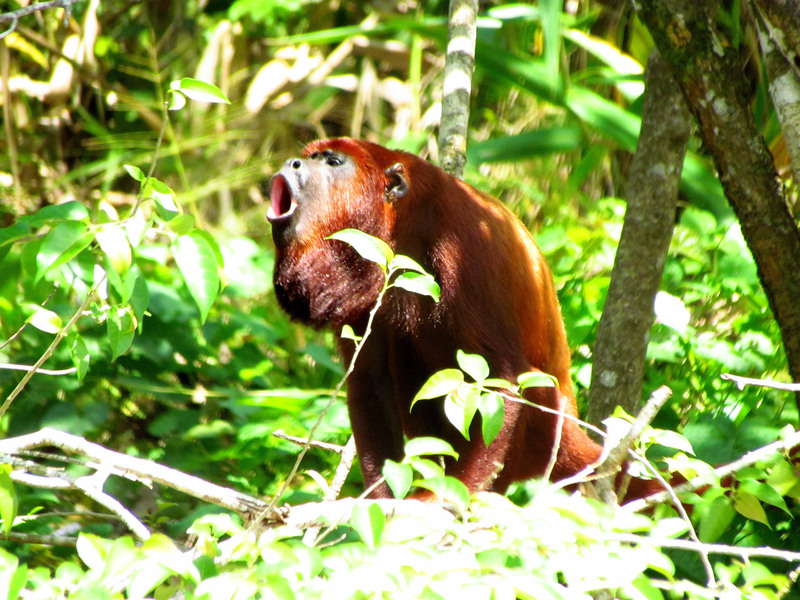 It’s hard not to fall in love with the cute pygmy marmosets or the owl monkeys and capuchins, but I think the red howler got the most attention for its amusing sounds and mischievous antics. As it was high season and water levels were high, we spent much time on the river, as opposed to the land, which provided an ideal perspective for spotting wildlife. It also gave us a great opportunity to examine creatures that reside within the river itself, from the multitude of exotic fish to the eely water snakes and caiman. The pink river dolphin was the star attraction. Born grey, these dolphins become pinker with age because their skin gets more translucent, allowing the blood to show through their bodies. When we came upon a small pod of these flamingo-hued, playful mammals, everyone jumped up in the boat and tried to take pictures of them. Most of us were unsuccessful in capturing that special Kodak moment, as the dolphins spent only a nanosecond above the water, teasing us with their splendid color. Instead of being frustrated, however, I decided to sit back and fully absorb this spectacular sight, taking my own mental photos for later. The dolphins reappeared several times during our trip and even made an appearance while we were swimming in the river. 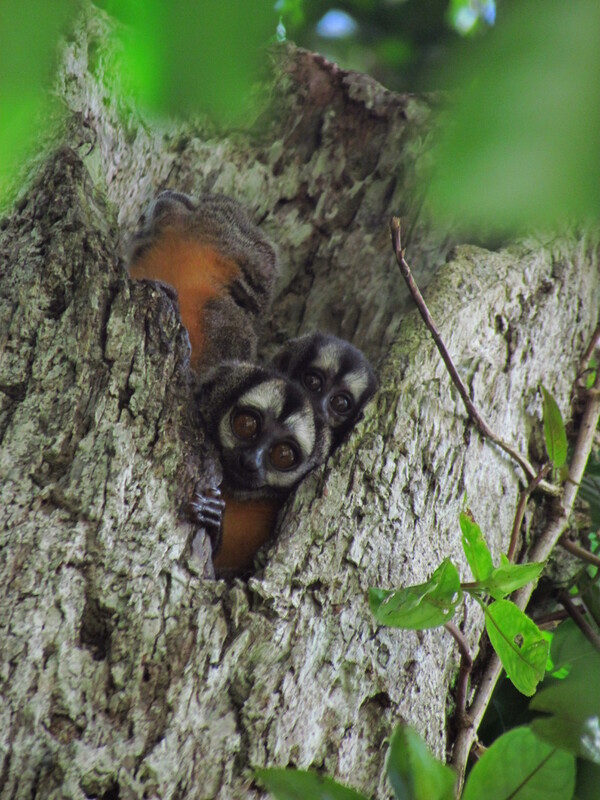 Through observing and studying wildlife is the main focus of an Amazon riverboat journey, there are so many other aspects to this adventure. When we weren’t riding in the skiffs in search of creatures, our group visited villages and interacted with the local people. One morning, we went to a school where we donated supplies, taught the children the “Hokey Pokey” and learned about the educational system. Educational opportunities are few for kids who grow up in the Amazon, unless they opt to move to the city of Iquitos, capital of the Peruvian Amazon, where secondary schools and colleges exist. Iquitos, with a population of 400,000, can only be reached by river or air, as there are no roads connecting it to the outside. Surrounded in all directions by forests and a maze of rivers and streams, it is an oasis in the midst of the Amazon. The city is the hub of civilization in the region, and is also the arrival and departure point for riverboat trips. Another time, we met with Maestro Juan, a wizened and wise shaman, who shared information about his eight-year training regimen, which began at the age of seventeen. He told us he was born with the “gift” and that he has the ability to talk with the spirits of plants after ingesting a highly hallucinogenic botanic, which sends him into a deep trance. He grows his own plants for medicinal purposes and treats others who are ill with his portable “rainforest pharmacy.” At the end of the session, he offered us each a blessing for safe travels. We came across many Ribereños, or river people, of all ages in their various watercraft, ranging from dugout canoes to small motorboats, as boating is the sole method of transportation in the region. The river is life on the Amazon, and all activities are centered on it. It is a main source of drinking water and food, with fishing the dominant industry and livelihood of the people. Kids at a young age become very adept at handling boats, because they use them as a means to get to and from school each day. And when it’s election time, the government sends in the military to set up floating booths along the Amazon, ensuring that all people are able to cast their votes, as voting is mandatory in Peru. Fishing for red-bellied piranha was another unique and entertaining activity that our group engaged in during the trip. The technique was simple: Skewer a piece of raw meat to a hooked line, thrash the thin wooden pole in the water to attract the attention of the piranhas and then pull up when you feel a tug. Even I, who have had little to no fishing experience, was successful in catching one of these carnivorous creatures. I didn’t spend much time admiring my catch; rather, I quickly handed it over to the boat driver, trying to avoid the fish’s sharp teeth and violent movements. The piranha’s ferocious reputation is most deserved, and many a local fisherman bears the scars of carelessness when handling them. Sunsets in the Amazon are pure magic. Most of the time, by late afternoon, we were back on La Estrella Amazonica, enjoying happy hour on the top open-air deck, and listening to our multi-talented naturalists and crew play everything from traditional Peruvian folk music to American rock ‘n’ roll. We watched the sky slowly become a collage of fiery colors before darkness set in and paved the way for stars to give us a double feature. One evening, we took the skiffs out for a ringside seat to this performance. We were serenaded by a chorus of frogs, while fireflies and glow worms winked flirtatiously at us. Our guides and boat drivers used their beacons and spotlights to locate nocturnal wildlife. Seeing the red eyes of a caiman blaze in the darkness gave me an eerie feeling, knowing that these and other creatures in the jungle were watching our every movement. Living quarters on the charming La Estrella Amazonica are cozy, yet comfortable for the 28 passengers and crew. In addition to staterooms, there’s a dining area, lounge/bar, lecture/meeting room and even a tiny workout facility. Food is served buffet style with several entrée options, including fresh fish, and plenty of delicious tropical fruit and veggies. Staff are accommodating and hospitable, making every effort to please. They are gracious and polite, and never fail to greet you with a warm, welcoming smile. They also have a great sense of humor, which automatically sets passengers at ease. The naturalists are not only guides extraordinaire, but musicians and storytellers. They enjoyed regaling us with Amazonian folklore, which often dealt with superstitions and myths about such creatures as the jaguar, sloth and pink dolphin. Many of the tales had morals and warnings that people in the villages continue to adhere to even today. In the span of our week-long trip, we went a total of 640 miles on the river. We explored several tributaries of the Amazon, as well as the famed Pacaya-Samira National Reserve, one of the largest protected areas in Peru, with a size approximating Belgium. Its main purpose is to preserve ecosystems of the Omagua Region and to promote sustainable development of local villages. The reserve’s biodiversity is immense, and the level of involvement of residents in regards to conservation is remarkable. Nearly 93,000 people live in and around the area within 208 communities. Rangers work with residents to preserve this unspoiled locale, and they take their role seriously. Throughout the journey, I kept my eye out for the elusive Mrs. Conda; first name, Ana. As the days went by without a sign, I began to accept the reality that this legendary snake and I were destined not to meet. At the tail end of the trip, we went on a jungle walk, where local trackers came along to assist naturalists in finding various creatures. As we trekked through the thick foliage, lined by walking palms and massive banyans or “Avatar-like” trees with their gnarly roots and thick trunks, the intensity of color was almost blinding. After examining such creatures as bullet ants, poison dart frogs, horned toads and a red-tailed boa constrictor, we heard a sudden shout. Mrs. Conda had been found, exactly where expected – on the edge of a boggy swamp, well-camouflaged in her eco-green skin. The tracker picked up the snake and held it out to us for a good look, keeping his hands and body away from its fangs, while it struggled mightily and forcefully to be released. Though the anaconda is not venomous, it is incredibly powerful and employs constriction to subdue its prey. We noted that the snake’s girth was large (some grow as big around as a grown man), but that it was not very long in size, and one of the naturalists commented that it was probably an immature anaconda. I was ecstatic nevertheless with this younger version, a Miss Conda, if you like – mission accomplished! 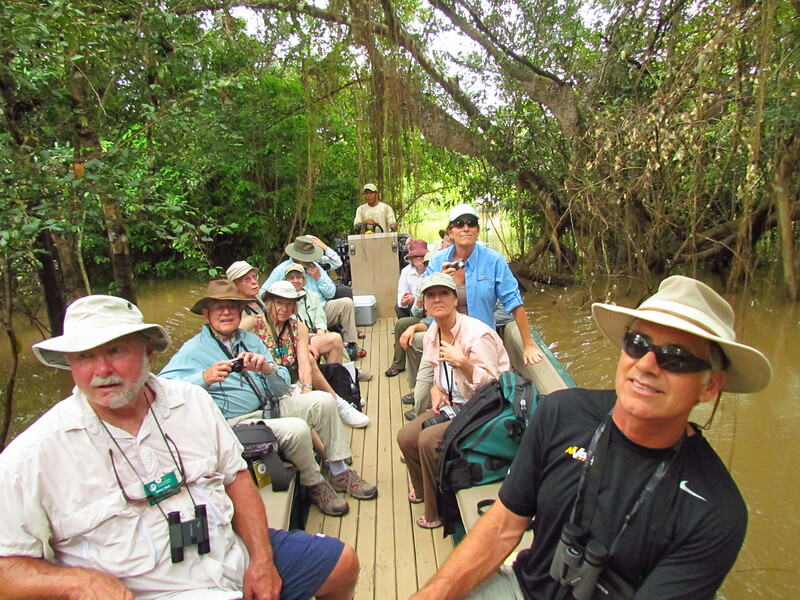 There are a number of companies that offer riverboat trips in the Peruvian Amazon. I opted to go with International Expeditions, due to its stellar reputation in the industry. It is a pioneer in ecotourism and is known as a world leader in small-group nature travel, with a host of award-winning experiences and unique itineraries to far-flung destinations. I was also attracted to the company because it has a long history of supporting conservation projects across the globe. In the Amazon, for example, it helps to fund ongoing conservation efforts, such as building water-treatment plants in villages, funding the Amazon Medical Clinic and developing Las Malvinas Urban Garden Project in Iquitos, Peru. For more information about International Expeditions: www.i.e.travel.com.